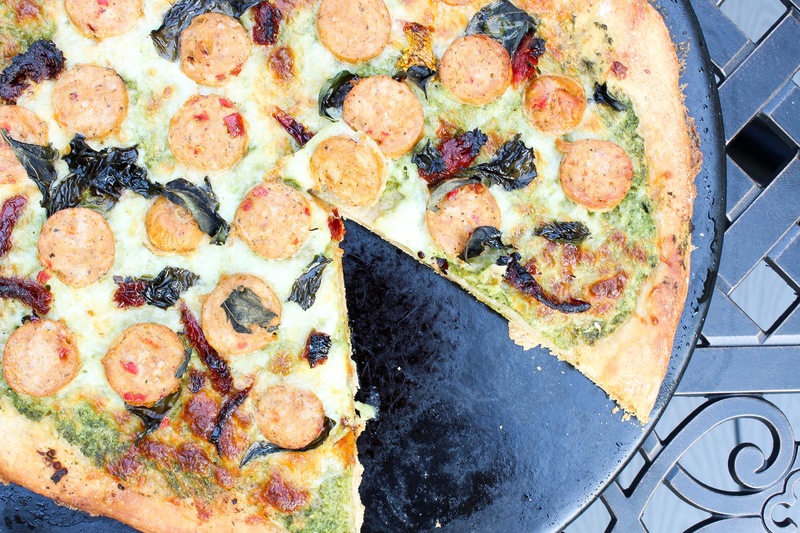 Homemade pizza with a homemade pesto sauce is an easy weeknight dinner that the whole family will enjoy! There is not much that makes me happier than a warm, sunny Friday evening in the summer. The thought of getting out of work, picking up a 6 pack or bottle of wine and cooking a nice dinner is what gets me through the day! If the humidity isn’t bad, which it has been recently in Connecticut unfortunately, you’ve hit the jackpot! And there is not a more laid back dinner to make on a Friday than homemade pizza! The best part about homemade pizza is it’s a great way to use some left overs in your fridge and make room for next week’s groceries. 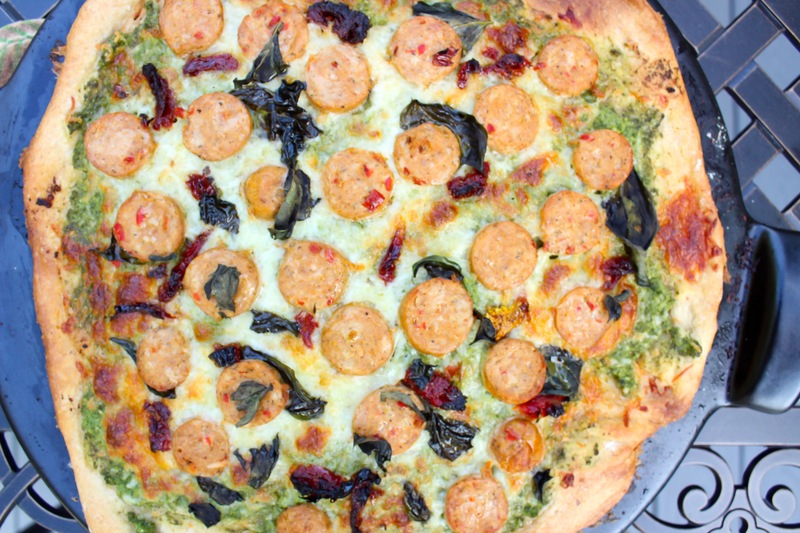 For this pizza, I used a veggie pesto sauce which was originally planned for my son’s pasta, but I forgot about it! Any kind of pesto sauce will do – homemade, store bought, veggie, or traditional basil. To make the veggie pesto sauce, I added to a food processor four large kale leaves, one cup of cut zucchini, a handful of raw baby carrots, and shredded Parmesan cheese. Blend in the food processor and drizzle in olive oil until the desired consistency is reached. When making homemade pizza, heating your pizza stone is a HUGE must. The longer you heat it, the more crispy and crunchy your pizza dough will be. We usually heat ours in a 500 degree F oven for 20-30 minutes. The prep time for the pizza includes heating the pizza stone. While the stone is heating, I will roll my dough out either on a clean counter or a cookie sheet in order to prevent burning myself. Preheat oven to 500 degrees and heat pizza stone for 20-30 minutes. Remove pizza stone from oven and wipe down with olive oil. Carefully stretch pizza dough out on pizza stone and cover with pesto sauce. Sprinkle cheese on, then add chicken sausage, sundried tomatoes, and basil. Bake at 450 F for 15 minutes.